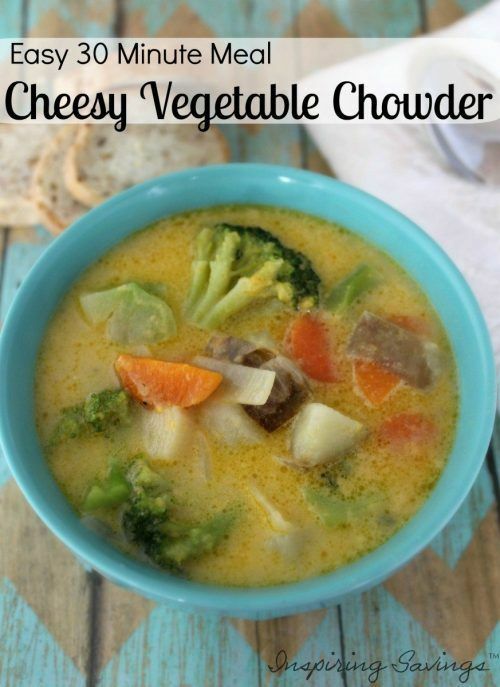 This cheesy vegetable chowder is a delicious, filling way to pack in the veggies! It’s creamy, flavorful and downright delicious. Make this meal in just 30 minutes. Making homemade Cheesy Vegetable Chowder doesn’t need to be complicated. After all, who wants to spend all day in the kitchen cooking. I know I sure don’t. You are going to want to try this delicious one-pot Cheesy Vegetable Chowder, an easy and light dish. Perfect to have in the summer, fall or winter time. My husband and kids are BIG soup eaters. I have learned to make lots of yummy soups in the winter time, but now I get requests for soup even in the hottest of summer days. We enjoy this recipe simply for many reasons, (one) it is delicious and (two) that you are not in the kitchen all day making it (I know… I am repeating myself, but it is true). This chowder will feed our family of four and then some. I enjoy making double batches of food and freezing the rest for a later meal. Having a second meal in the freezer waiting for me to defrost instead of making from scratch on a busy day is a Win/WIN! If you are a freezer meal fanatic like myself you are going to want to get your hands on these Jokari Hands-Free Baggy Rack Storage Bag Holders. Believe me, this will make prep work a ton easier. Time to grab your ingredients and let’s get cookin’. Simple ingredients are all you really need. This recipe is a great choice for Meatless Monday. Only cold rainy days this meal will warm you up and fill you up. First, you are going to want to chop and prep all your veggies. Once you get this step out of the way, this meal comes together fast and easy. I do say; the chopping is the hardest part! After you have finished chopping up your vegetables, melt butter in a large soup pot. Then add in onions, carrots, and celery and sauté over medium heat until tender. (2 – 3 minutes). Once tender, add garlic and cook 1 or 2 additional minutes. Next, add in your chicken broth and potatoes, bring to a boil, and cook until potatoes are tender. Mix flour with water, add and simmer until soup is slightly thickened. Add milk and broccoli and cook until broccoli is just tender and soup is heated through. Stir in cheese, allow to melt, and serve. This is when it turns into that Making a homemade chowder doesn’t need to be complicated. Who wants to spend all day in the kitchen? Not I! So, grab a spoon and start slurping! 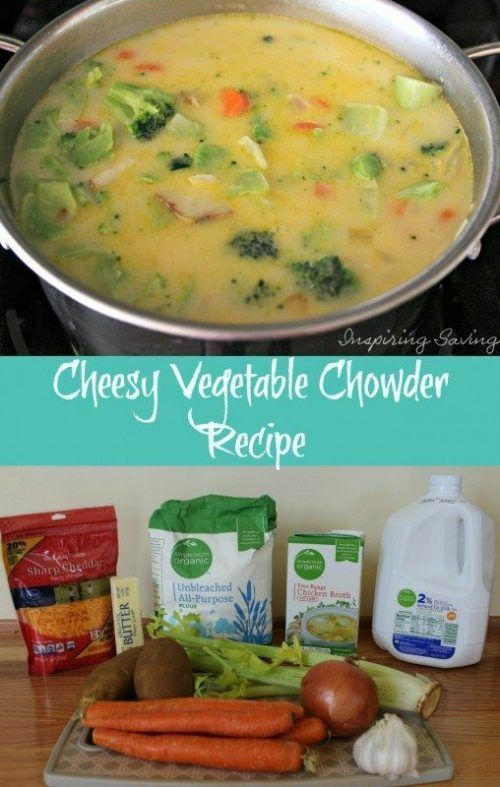 Enjoy your delicious Cheesy Vegetable Chowder. You can make it as thick as you’d like, or a little bit runny if that’s how you prefer your soup. It is all about adding a little more shredded cheese. Below you will find my family’s recipe. 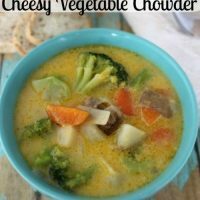 This cheesy vegetable chowder is a delicious, filling way to pack in the veggies! It's creamy, flavorful and downright delicious. Make this meal in just 30 minutes. Add chicken broth and potatoes, bring to a boil, and cook until potatoes are tender. Mix flour with water, add and simmer until soup is slightly thickened.